Having climbed Mt Blanc five times over 20 years, Barry Roberts decides there has to be a better way to descend that is easier on the knees. So this time, he brings his paraglider with him. In 1988 I witnessed a day-glow-clad French climber fly off Popocatepetl, a 5,426m live Mexican volcano which I’d just climbed. This was the very early days of what we now call paragliding (or ‘parapente’ in France) and the ‘chutes’ were stripped down skydive canopies. Roll on a few decades and this sport has developed massively in two important respects. First, the equipment has been revolutionised so it’s now lighter and faster in the air, with dramatically improved glide ratios (the ratio of sink to glide). After all, the aim is to stay up, not float down like a parachute. Secondly, safety has greatly improved. Glider wing testing and certification now help pilots differentiate between beginner wings that are safer to fly and the ‘hot hatches’ of our sport that demand more skill and experience. In short, there’s no longer a stark trade-off between safety and performance and these developments have paved the way for high mountain paragliding adventures that don’t have to be suicide missions! September 8 is a memorable date for me; not because it is my wedding anniversary but because my friend Tim Burton and I finally managed to fly off Mont Blanc this day in 2009. Paragliding off Mont Blanc demands luck with the weather as much as it does with logistics, mountaineering ability and flying skills. The summit dome of ‘the Blanc’ is unimpressively set back from the steep rock ‘aiguilles’ or needles that loom over Chamonix. Nevertheless, the massif dominates the valley. At 4,810m high – nearly 4,000m (close to 2.5 miles!) above the bars and boulangeries – Mont Blanc is truly Himalayan in scale and, as such, is a magnet for peak baggers, walkers, skiers and ultra-distance runners. I’ve climbed it five times over 20 years, from three different routes on the French side, including a traverse with my future wife when I proposed on the summit. I’ve also skied up and down it with Tim. Another ascent beckoned but this time my goal was to avoid the punishing knee-jarring descent and to paraglide down. In September ’08, Tim and I were poised to attempt this but were foiled by the weather so we tried again in ’09. Whilst I watched 5,600 competitors battle their way around Mont Blanc in The North Face Ultra-trail du Mont Blanc race at the end of August, Tim and I were firing emails back and forth, getting ready and watching the weather. Tim even chucked his girlfriend to free up his diary to join me. We needed a light northerly, easterly or south-westerly wind to take off and the forecast looked promising. 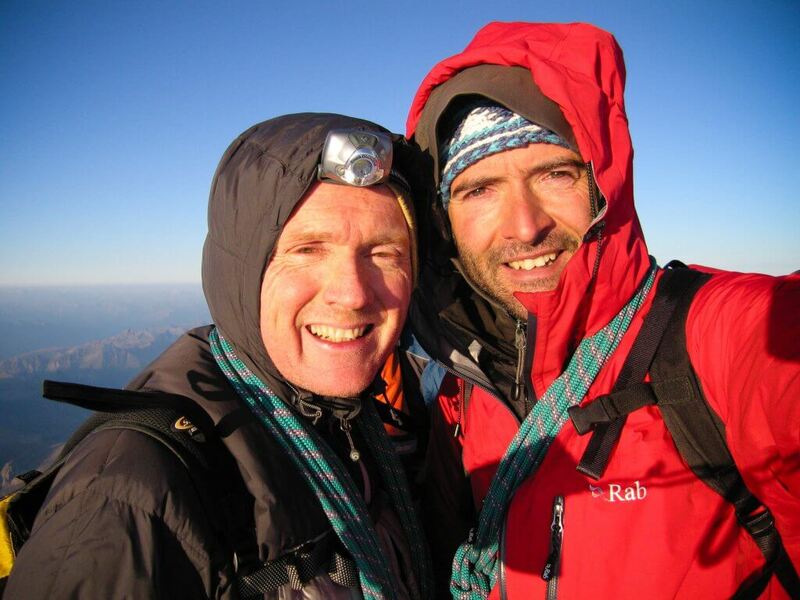 We were reasonably fit having climbed the Gran Paradiso (4,061m) near Aosta, Italy, to acclimatise. But to coincide with the favourable forecast we still needed to secure mountain refuge reservations. Finally, after many persistent phone calls we landed bookings at the two refuges on the ‘voie normale’ Goûter route. Ours would be a slow, very gradual ascent, timed to reach the summit in the forecasted good weather window at dawn on 8 September. We had one shot – our flights home were the next day. On 6 September, after a car journey, telecabine lift and Tramway du Mont Blanc ride, we reached the Nid d’Aigle 2,372m. From here a gentle 795m ascent leads to the gleaming new Refuge de Tête Rousse at 3,167m and we caught up with a load of mountain guide friends and discussed the conditions ahead. Of particular interest, and dread, was the state of the Grand Couloir, which is a deadly unavoidable avalanche chute en route to the Refuge de Goûter (3817m) 650m higher. The gulley was bone dry; stones and boulders reigned down without warning, but we managed to leg it safely across. The rest of the route was a loose scramble up a rocky buttress laced with iron cables and dotted with teetering, exhausted descending climbers who kick rubble down. Ear plugs were a must to screen out the plastic bag rustling and other nocturnal noises of the French, Italians, Hungarians, Spaniards etc sharing our Goûter dorm. We were the only ‘anglais’. Everyone is entitled to a schoolboy error on a trip and mine was getting debilitating heel blisters climbing Gran Paradiso. Tim’s was forgetting earplugs, but I found a discarded pair in my bunk for him. Can you get swine flu from used ear plugs, I wondered? We departed at 3am with about 100 other climbers. A radiant full moon lit the way making head torches redundant. The wind puffed lightly on our left cheeks from the north-east as we walked up the west ridge at a comfortable 5m/minute ascent rate, careful not to top out too early in the dark where it would be too cold to linger. Despite the numbers of other climbers, it is a big hill and the crowds soon dispersed. At 4,365m we rested and it turned much colder. We togged up in duvet jackets and big mitts and fired up our chemical hand warmers. The wind freshened but neither of us mentioned this as if to speak it would guarantee that it would be too strong to fly (20km/hr maximum at 4,000m is recommended). Being blown over the back, south into Italy would be unthinkable. Suddenly, ahead of us, a glider wing reared up into view over the summit crest and a pilot was airborne. It was flyable! Tim took off first with an excited yelp. As I prepared to follow, the wind picked up and started to gust and my SKY Cima glider sloshed around on the slick icy surface. The lines tangled and I descended 100m to sort them out in lighter wind. Eventually, I was in the sky floating on the silky smooth lifting air. I beat back and forth in a figure of eight pattern about 200m above the summit, alone at over 5000m. Tim had been soaring above me but finally got too cold and headed to land. The panoramic views into Italy and Switzerland were immense. After 20 stunning minutes of soaring, and fearful of the strengthening headwind, I settled back to savour the 40-minute glide to the Chamonix landing field. The occasional burble of turbulent air reminded me that landing below on the fragmented Bosson Glacier wasn’t an attractive option and I didn’t have a reserve parachute. Tim and I embraced when I landed – part relief, part celebration. Within the hour we were tucking into a full fried breakfast at a café and asked ourselves were we really just on the summit of The Blanc two hours ago? You don’t have to be a climber – or even a pilot – to tackle Mont Blanc. 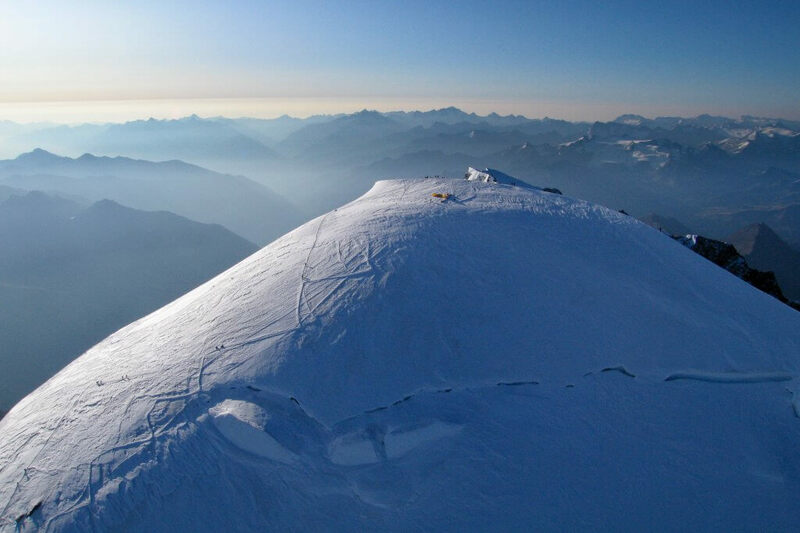 With a professional mountain guide that is also a tandem pilot, flying Mont Blanc is a big tick adventure if you’ve got the time, stamina, a thick wallet and lady luck on your side. Bon vol! When to go: Flying off Mont Blanc is illegal during July and August because of helicopter traffic (1,400 chopper rescues in summer 2009). Winter conditions prevail until May and the refuges and lifts shut late September so this only really leaves June and September for a summer flight. Mountain medicine: AMS (acute mountain sickness) and its more insidious relations HAPE and HACE (high altitude pulmonary or cerebral oedema respectively) are potentially fatal and real risks when climbing rapidly to nearly 5,000m. Over exertion and dehydration are contributory factors. The British Mountaineering Council offers expert advice on mountain medicine and Wilderness Medical Training runs advanced courses. Refuges: These refuges are operated by the Club Alpin Francais. The Refuge du Goûter is often overcrowded with people who turn up without a reservation (very frowned upon) who sleep in the dining room (which they still have to pay for). Budget €80 per day for refuge accommodation, meals and drinks. You’ll endear yourself to the hardworking staff if you offer to dry up the pots and pans after supper. 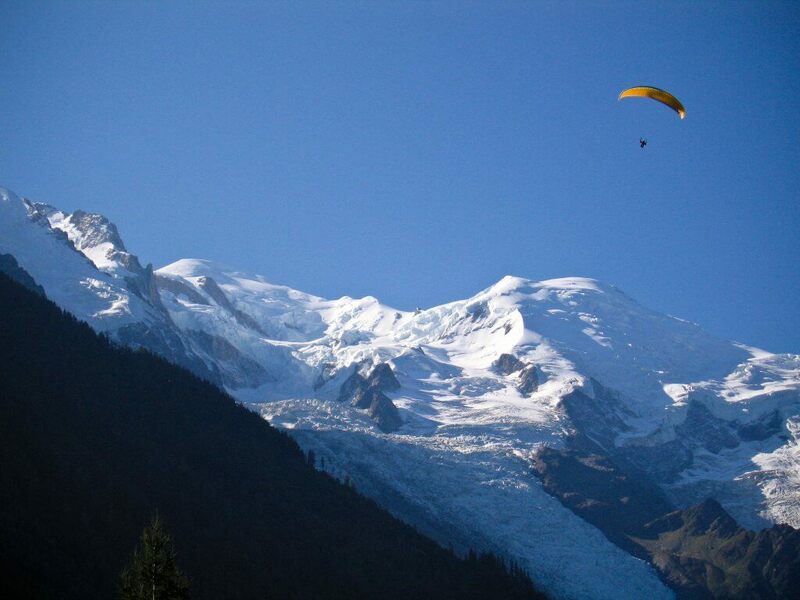 Reading: ‘Free Flying in the Mont Blanc Region’ is a useful free publication available from the Chamonix tourist office. It advises that “this is a high mountain, para-alpinism launch, and as such is extremely demanding. It is for experienced mountaineers only and requires extensive preparation and excellent analysis of the conditions. Remember that your ability to make good judgements will be reduced by the altitude, lack of oxygen and fatigue”. Download the latest version from the Chamonix club website. 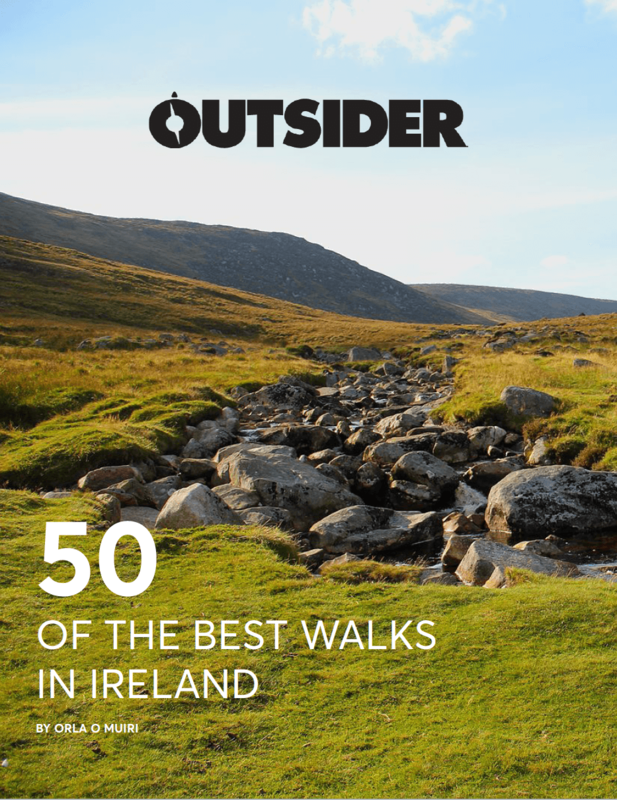 Mountain courses, guiding and tandem flying: Contact Irish mountain guide Robbie Fenlon for training and courses. Mountain Tracks has guides that are also pilots. 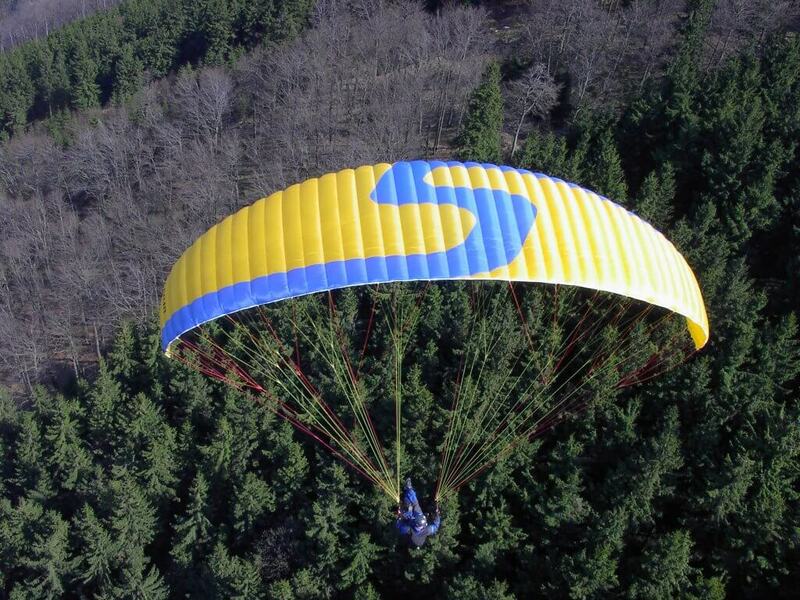 Acknowledgements: Many thanks to Martin Nemec at SKY Paragliders for his continued support and generosity.